As the hilarious ads point out, it’s a bad week to be a seal (RIP, Snuffy), but an awesome one to be a shark fan, with the Discovery Channel’s hugely popular series, Shark Week, creating a bigger splash than ever in its 26th season. When the much-anticipated series debuted this past Sunday, a record 4.8 million viewers tuned in, according to Nielsen figures. But the toothy good times don’t have to end when Shark Week does this Sunday, Aug. 11. On the contrary, the current range of shark-centric travel and excursions is truly staggering, offering adventurous souls numerous opportunities for climbing into cages, snorkeling with, and sidling up to these fearsome ocean predators in their natural habitat. Here, a few ways you can re-create your own real-life Shark Week experience. South Africa’s shark-infested waters are featured prominently throughout Shark Week, and no surprise why: They’re home to more than 200 different species, including the largest known population of the famed Great White shark. 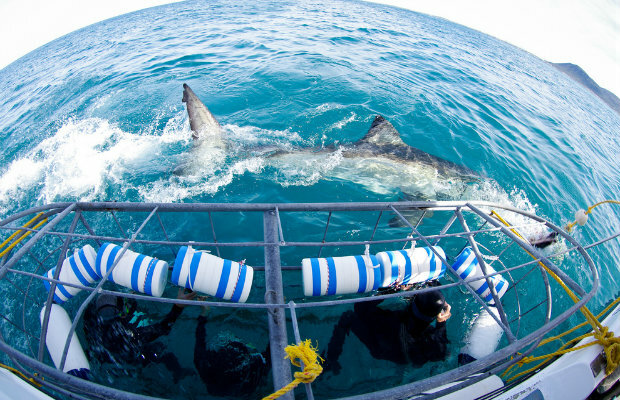 There are myriad ways to have a shark-centric adventure here, which range from the seriously scary (open-water diving in famed shark hotspots like Cape Town’s False Bay, KwaZulu-Natal’s Aliwal Shoal, and the aptly named Shark Alley near the fishing village of Gansbaai), to adrenaline-soaked (cage diving, with no diving certification necessary, in places such as Hout Bay, Dyer Island, Mossel Bay, and KleinBaai in Cape Town, and from Rocky Bay out of Durban) to exhilarating offerings for landlubbers (you're guaranteed to see a shark, and perhaps a feeding, at Seal Island in False Bay, which is home to more than 60,000 Cape fur seals). One top operator is Marine Adventures. In addition, shark fans have a chance to win a Shark Diving Adventure via the Shark Friendzy contest on the Visit South Africa Facebook page. In an interactive game that simulates an underwater cage dive, fans can upload a photo of themselves to fit inside a diving suit mask, earning the chance to win airfare for two from New York to Capetown and a cage dive courtesy of South African Airways and Marine Dynamics. The contest runs through August 16. Shark Diver, a leading operator in Mexico, takes guests from the San Diego airport to the island of Guadalupe, where brave divers may catch a glimpse of great whites that may include a 15-footer Shredder or a 16-footer named Bruce from within the protective confines of a cage. In addition, the outfitter also offers submarine diving with pre-historic Six Gill sharks at depths of up to 2,000 feet. Shark season there runs from August through November, and there are still available dates for booking. Belize’s Shark-Ray Alley, a stretch of turquoise water located just off the gorgeous island of Ambergris Caye, gets its name from the hundreds of gentle nurse sharks and stingrays that inhabit its crystalline environs. Several tour operators, such as the well-reviewed Seafarious Adventures, have experienced guides who know how to chum the waters to attract the sharks, but also stay close by, ensuring that guests keep a safe distance from the animals. A small island off Mexico’s tourism circuit, Isla Holbox, just off the Yucatán Peninsula, is home to the world's largest fish: the whale shark. Get up close with this plankton-eating gentle giants with Natural Habitat Adventures, the World Wildlife Fund’s travel partner, which takes a maximum of 15 guests to swim with the world’s largest fish – which average 40 feet long and weigh an average of 15 tons. Another solid choice for newbies to swimming with sharks, Hawaii Shark Encounters doesn’t require any prior diving experience – but the excursion still allows adventurous types to get into a cage and come face-to-face with the ocean predators. Excellent tour guides provide background info about sharks, as well as their role in Hawaiian culture and its ancient belief systems. With superb visibility, seeing a Galapagos or sandbar shark is almost a given. Better yet, if you don’t see one, you don’t have to pay.